Frontier Trails, located near Frederic, Wisconsin, about 40 minutes from Woodland Trails Bed and Breakfast, offers guided trail rides. Select rides of a half hour, one hour or two hours. Reservations and a liability waiver are required. Driving directions to Frontier Trails are: From WI Hwy 35 in Frederic, take Hwy 48 west 3 miles; Right on County Line Road & follow it to the “T”; Left on Whispering Pines Road about one mile to Frontier Trails. Call Wendy & Lydell Larson for further information: (715) 327-8572. 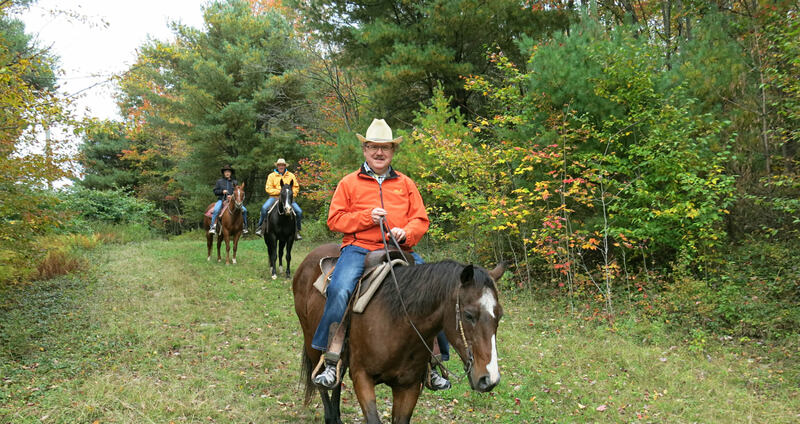 To meet and talk with horse enthusiasts, the Tamarack River Horse Camp is located just five miles up the road from Woodland Trails Bed and Breakfast. On most weekends from May through October, the camp is full of people who love talking about their animals.